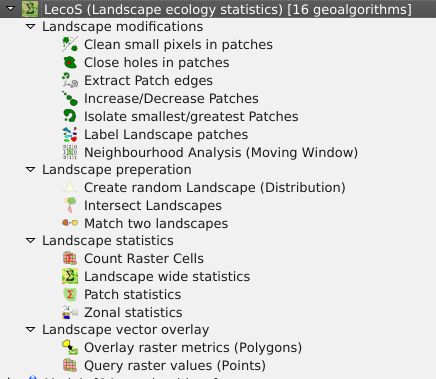 As I can see my QGIS plugin LecoS is still widely used and downloaded from the QGIS plugin hub. I have noticed that some people already started referencing ether my blog or the QGIS repository in their outputs, which is fine, but after thinking about it for a while I thought why not make a little descriptive article out of it (being an upstart PhD scholar and scientist an’ all). I am now happy to announce that this article has passed scientific peer-review and is now been published in early view in the Journal of Ecological Informatics. The quantification of landscape structures from remote-sensing products is an important part of many analyses in landscape ecology studies. This paper introduces a new free and open-source tool for conducting landscape ecology analysis. LecoS is able to compute a variety of basic and advanced landscape metrics in an automatized way. The calculation can furthermore be partitioned by iterating through an optional provided polygon layer. The new tool is integrated into the QGIS processing framework and can thus be used as a stand-alone tool or within bigger complex models. For illustration a potential case-study is presented, which tries to quantify pollinator responses on landscape derived metrics at various scales. The following link provided by Elsevier is still active until the 23 of January 2016. If you need a copy later on and don’t have access to the journal (sorry, I didn’t have the money to pay for open-access fees), then feel free to ether contact me or you can read an earlier prePrint of the manuscript on PeerJ. So if you are using LecoS in any way for your work, it would be nice if you could reference it using the citation below. That shows me that people are actively using it and gives me incentives to keep on developing it in the future. Martin Jung, LecoS — A python plugin for automated landscape ecology analysis, Ecological Informatics, Volume 31, January 2016, Pages 18-21, ISSN 1574-9541, http://dx.doi.org/10.1016/j.ecoinf.2015.11.006. The full sourcecode of LecoS is released on github. There are many interesting things to calculate in relation to landscape ecology and its statistical metrics. However many (if not the majority) of the published toolsets are not reproducible, their algorithm code not published or open-source. Obviously this makes the easy implementation of underlying algorithms even harder for independent developers (scientists) if you don’t have the time to reproduce their work (not to mention the danger of making stupid mistakes, we are all human). I recently found this new article in Methods in Ecology and Evolution by Etherington et al., who didn’t really present any novel techniques or methods, but instead provided a new python library that is capable of calculating Neutral Landscape Models (NLMs). NLMs are often used as nullmodel counterpart to real remote-sensing derived maps (land-cover or altitude) to test the effect of landscape structure or heterogeneity on a species (-community). Many NLM algorithms are based on cluster techniques, cellular automata or calculating randomly distributed numbers in a given 2d space. There have been critical and considerate voices stating that existing NLMS are often misused and better null-models are needed for specific hypothesis, such as a species perception of landscape structures. Nevertheless NLMs are still actively used and new papers published with it. The new library, called NLMpy, is open source and published under the MIT licence. Thus I can easily use and integrate into QGIS and its processing framework. Their NLMpy library only depends on numpy and scipy and thus doesn’t add any other dependency to your python setup, if you already are able to run LecoS in your QGIS installation. The NLM functions are visible in the new LecoS 1.9.6 version, but only if you have NLMpy installed and it is available in your python path. Otherwise they won’t show up! Please don’t ask me here how to install additional python libraries on your machine, but rather consult google or some of the Q&A sites. I installed it following the instructions on this page. This is a quick and dirty implementation, so there could occur some errors. You should use a meter-based projection as extent (such as UTM) as negative values (common in degree-based projections like WGS84 latitude-longitude) sometimes result in strange error messages. You also have to change the CRS of the generated result to the one of your project manually, otherwise you likely won’t see the result. Instead of the number of rows and columns as in the original implementation, the functions in LecoS are based on a selected extent and the desired output cellsize. For more complex modelling tasks I would suggest that you use the library directly. To give you a good start Etherington et al. also appended some example code and data in their article´s supporting information. Furthermore a few days ago they even had a spatial MEE blog post with some youtube video demonstrations how to use their library. So it shouldn’t be that hard even for python beginners. Or you could just use the processing interface within LecoS. In addition I also temporarily removed LecoS ability to calculate the mean patch distance metric due to some unknown errors in the calculation. I’m kinda stuck here and anyone who can spot the (maybe obvious) bug gets a virtual hug from me! This is just a quick posting informing all the QGIS interested readers of this blog that I am about to release a new QGIS plugin. 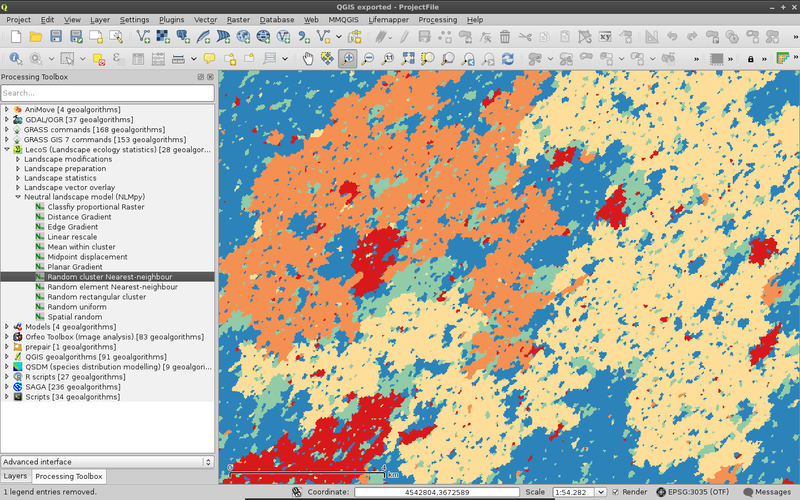 It’s name is QSDM (QGIS Species Distribution Modelling) and similar as with LecoS it is particular suited for the practicing ecologists out there. This time i had no plan and interest of coding a graphical interface and thus the whole plugin can only be executed from within the Processing Toolbox (QGIS version > 2.0 ). In my opinion this will be the future of most advanced QGIS plugins anyway. So what is the idea? Basically QSDM is a plugin taking statistical models for species distribution modeling to QGIS. For now only the famous Maxent is enabled and working, but the ambitious plan is to enable other modeling techniques such as RandomForests and LogisticRegression as well if the user has the necessary libraries enabled. You might ask what is the advantage of running Maxent from within QGIS? First, you can immediately see the output so it is nice for visual exploration. Second, the QSDM plugin helps you with the formating of your layers and occurrence files. For instance all input raster layers are automatically unified to a common resolution and exported as ESRI .asc files. You simply need to load in your layers and let the tool do the rest. For those of you who want more control (and I really insist that you want to), I also enabled functions to generate a custom parameter file for Maxent and enabled an option to start the Maxent GUI in a new process. –> I recognize that the easiness of this tool might tempt more people to execute tools without really understanding what they do and how they work. Please be sure what you do and always (!!!) validate the outputs of the tools you use (this includes QSDM). For understanding Maxent parameters I highly recommend reading the attached literature list and this publication! Can calculate Schoener’s D or Warren’s I based on Hellinger distances for all input layers. Shows the difference between two input prediction layers. For instance for current and likely future conditions. More is planned, but this depends entirely on my inclination to do so, the time I have available and if it can be useful for my own research as well. Please remember that the plugin is still experimental. So please don’t be angry if it doesn’t work for you. 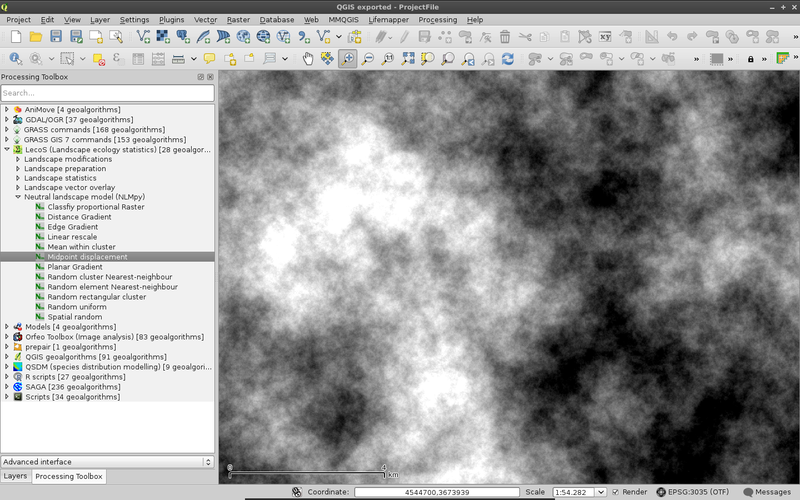 testing was conducted on QGIS 2.2 stable on my Debian Linux machine and it should hopefully work for Windows as well. But similar as with LecoS i have no opportunity to test the plugin on Mac OS based systems and I also don’t really intend to :-p. Sorry Apple. Just a little post with something not totally related with Ecology, but nevertheless quite useful for the daily work with GIS. Some time ago i got hand on a nice Garmin GPS device (Etrex 30) and i am constantly playing around with the options and opportunities for it. Especially in the interaction framework of fieldwork and desktop-based GIS processing. Now i was at the lucky situation to have some time available to go birding in the area of Vestamager southwest of Copenhagen, Denmark. My intention was to bicycle there and use the GPS for orientation (although i perfectly know the route 🙂 ). Thus i wrote this simple little R processing script (see a general introduction how to create R-scripts for processing here), which uses the route(…) function of the ggmap package to generate line layers from a point x to point y. Note, that by using this function you are agreeing to the Google Maps API Terms of Service and you are only allowed to send 2500 queries per day. Generate the route from x to y and specify bicycle as output. 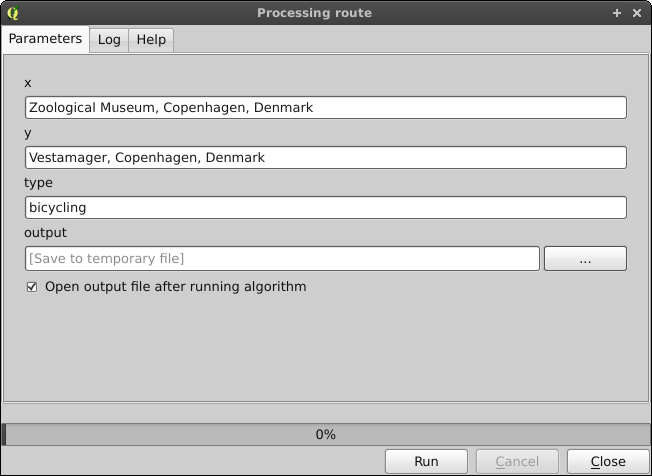 The generated output line is automatically loaded into QGIS after processing and has the total length and duration of the trip in its attribute-table. To use the script, create a new one in the processing toolbox and copy the contents below into it. Then copy it into your “~/.qgis2/processing/rscripts” folder. I will also post the script in the QGIS scripts section here on this blog. To use existing shapefiles from within QGIS, users are advised to take a look at the pgrouting extension for Postgis. See a nice tutorial for installation and configuration on windows machines here. Since QGIS 2.0 stable was released just a while ago, i thought that it would be time to enhance my plugin LecoS a bit more. Furthermore i also missed some functions, for instance i found no appropriate function to compute ZonalStatistics for a set of rasters of mine. SAGA has a function to calculate some stats using a categorical and a zone raster layer. However it is lacking a raster output and specific stats. 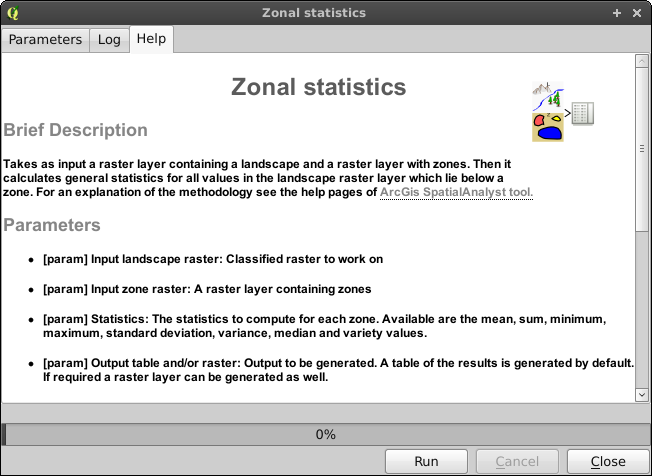 So i added a new ZonalStatistics function to LecoS and i am sure that it will be of some use to Landscape ecologists and other GIS users out there. See a usecase below! Furthermore i regularly use a lot of short python scripts to generate and query raster layers using a gdal+numpy backbone. Those custom functions of mine are a lot faster than any other plugin (all hail to numpy), which is why i also implemented some functions that are already available in QGIS through other plugins. I didn’t create any new graphical interfaces as i believe that sextante aka processing is the future. All new functions were therefore only added to the processing toolbox and not as seperate GUI. This also has the cool advantage that you could use all LecoS tools within more complex multi-algorithms models. The most visible difference to older LecoS versions is that i created a new icon for every function (make them distinguishable) and wrote documentary information. Click more to see a short tutorial demonstrating the functions using real data. Although not yet officially announced the QGIS Homepage has changed dramatically in preparation for the upcoming release of QGIS 2.0 (“Dufour”). Since its predecessor “Lisboa” many changes have happened to QGIS. I will try to list them here, but if you really interested then read the last posts on NathanW or Underdarks blogs. Improved Design and Buttons. Rearrangements and sorting of features. A lot of changes under the shell. The use of python scripting has become a lot easier. What does it mean for people in the Ecology and Conservation sector? Well, QGIS offers an easy to understand and free to use tool to map geographical relationships. Contrary to the still widely used ESRI ArcGis solutions, it can be used freely by everyone and is therefore especially useful in projects with not that much money involved (so literally 99% of conservation projects) or in capacity building actions. Furthermore there is an ongoing interest in making QGIS the leading GIS for Ecology. 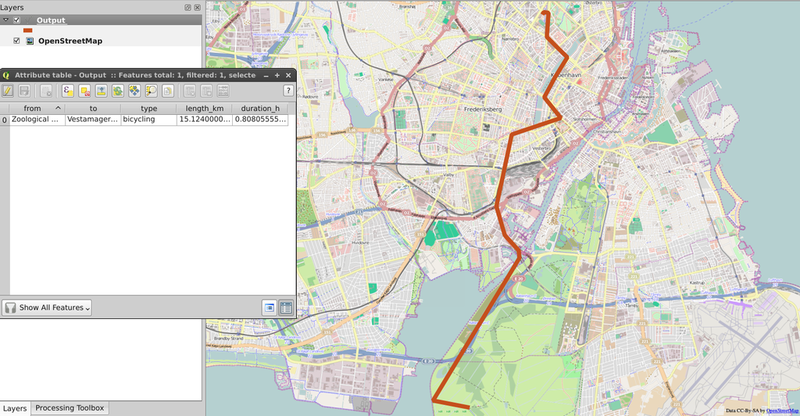 The aim is to extent QGIS functionalities through plugins such as for instance my LecoS plugin. I am currently considering to bring some basic functionalities for species distribution modeling to QGIS (some funds are always welcome 😉 ). Never used QGIS before? One more reason to try it out now. Download it here. You love it and want to work more with it (or switch from ESRI products)? Explore the documentation, all the plugins and features here. You have GIS related Questions? Visit the gis:stackexchange portal. I have just finalized one of many upcoming show-case maps demonstrating how the QGIS map composer has improved over the last time. Click the map to get to the flickr QGIS map showcase group which has many other nice examples of beautiful maps rendered with QGIS.